There’s a common misconception that ends up on a lot of “Secrets of Grand Central Terminal” lists (but not ours, of course!). It’s about the Redstone rocket, erected by the US military as a piece of showmanship to counter the Soviet Union’s launch of Sputnik. The Redstone was displayed in the terminal in 1957 for three weeks. This widely spread false fact is that the Redstone was so tall, it bore a hole through the top of Grand Central Terminal’s ceiling. The myth even goes as far to suggest that a hapless engineer didn’t do the math correctly. But this, as you can see in vintage photographs, was not the case. The concourse is 125 feet high, and even sites which attempt to debunk the Redstone hole story get this fact wrong. Regardless, the sister of the Redstone rocket still exists so can be measured, which according to this story about where it now sits in Warren, New Hampshire, is 70 feet. This Wiki of astronautics has the original Redstone at 69.32 feet. 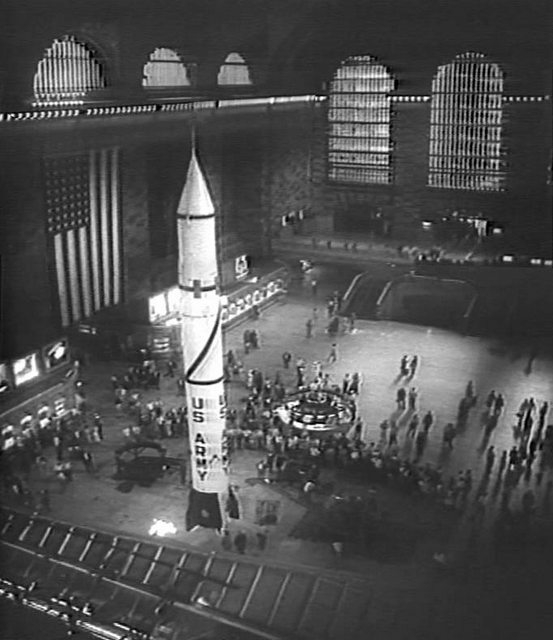 In 1957 The New York Times reported that the Grand Central rocket was 63 feet and the height was in the headline for the article. According to NASA, the later Mercury Redstone, which “took the first American to the edge of space,” was 83 feet tall, so the first generation Redstone at under 70 feet makes sense in the evolution of the rockets in this time period. All of this, still significantly shorter than the height of the Concourse. As for the myth, AMNY writes, “some genius didn’t think to measure whether it would fit in the concourse,” History.com writes, “someone forgot to bring a tape measurer,” and CNN writes, “So eager was the government to counteract anxiety around the Russian Sputnik launch, that it forgot to check whether the rocket would fit in the building.” Even PBS gets it wrong. The hole is still there, in the concourse ceiling at Grand Central despite renovations. You just have to look for it. See more quirky NYC facts and discoveries in our “Daily What? !” series. Read about the Top 10 Secrets of Grand Central Terminal. Get in touch with the author @untappedmich. What’s up with not saying where it is? Near the Pisces fish on the ceiling. The hole is easy to see once you know where to look. It’s really more of a round spot or blemish a couple of inches in diameter.